The French House is a historic, two-story brick estate and is absolutely one of my favorite venues in Cincinnati. It is the focal point of the quiet and serene French Park and is a perfect backdrop for a wedding. I recently spoke to Kimmy with Premier Park and Events to learn more about this Cincinnati wedding venue. Here’s what she was able to tell me! Q – What do you love most about The French House? A – I love that you can transform the venue into your own vision. Your event doesn’t have to be the same as the wedding the weekend before! There are tons of options to make it unique. A – Our event calendar opens up a year in advance (so the 2019 calendar will be available January 1st, 2018). In order to get the date they would like, I suggest a year. This way they have time to select their vendors and plan without feeling rushed. Q – What is included when a client books your service? A – They receive our vendor recommendations, as well as design/planning services, and day of coordination. Q – How do you help clients customize their service? A – We work closely with each client to help them select their event equipment (tables/chairs/linens, etc) to be sure it fits the theme/color scheme they are looking for. Q – What’s one interesting fact about The French House? A – There used to be two houses on the land. One was used for Mr. French’s everyday living, and the other was his party house! Q – Any advice for a couple searching for their perfect venue? A – I think choosing somewhere you both feel comfortable is essential. I always suggest looking at photos of past events to get inspiration. Also, choose somewhere that you feel doesn’t need too much decor. Simplicity is key for me. Each time I come back to this venue I find another hidden gem and I love it even more. The inside of this colonial styled house is simple, yet beautiful. The sunsets and views of the meadow from the house are nothing short but spectacular. Reserve the charming French House for your wedding or special event! Click here to see more photos from The French House by AJ Studio – Photography by Angela and Jaime. Click here to learn more about how you can have AJ Studio capture your special event. 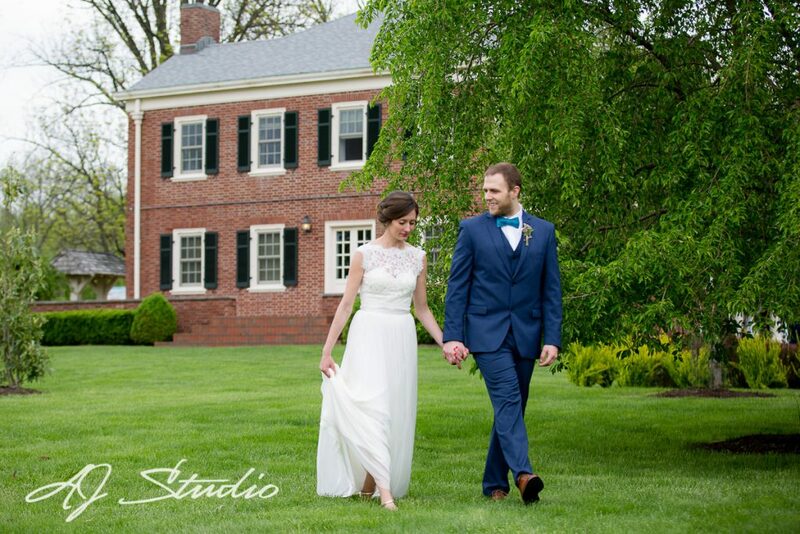 This entry was posted in Wedding venues and tagged Cincinnati Wedding Photographers, Cincinnati Wedding Venues, The French House.